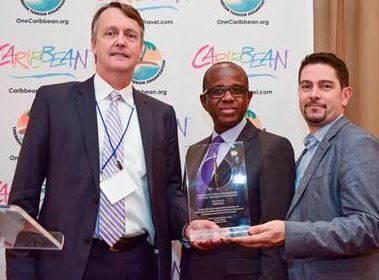 TORONTO, Canada, 22 November, 2016 – Two Canadian travel industry partners have been recognized by the Caribbean Tourism Organization (CTO) for their contributions to the region’s development through tourism. 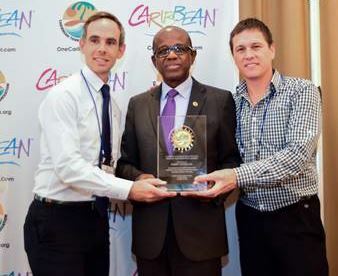 The CTO presented its Special Recognition Award to WestJet and Flight Centre Ltd at the Caribbean Tourism Industry Awards Luncheon in Toronto on 22 November held as part of Caribbean Media Day organised to underscore the importance of the Canadian market to the Caribbean. WestJet’s award was “in appreciation of your unquestionable commitment to the development of the Caribbean through tourism by providing a decade of outstanding, uninterrupted service to the region” while Flight Centre Ltd was “in recognition of your significant impact on the development of the Caribbean through tourism and your outstanding contribution to the region”. 2016 marks a decade of WestJet service to the Caribbean, with the Bahamas being its first international destination. Flight Centre Ltd is a leading retailer of travel products and services for the leisure and corporate markets. Its wholesale brand GOGO Worldwide Vacations supplies a variety of services, including packages, accommodation, tours and cruises, and is its largest global supplier of land product. NEW YORK, NY, 3 June, 2016 – Tourist arrivals to the Caribbean are expected to surpass the 30 million mark for the first time ever this year, following a record 28.7 million arrivals in 2015. Chairman of the Caribbean Tourism Organization (CTO) Richard Sealy announced here on Thursday evening that the industry got off to a fast start in 2016, registering a 7.3 per cent rise in the first quarter over the corresponding period last year. “This performance was buttressed by lower oil prices and the strong US dollar, which increased the appeal of the region to potential visitors. The many air service agreements ensured that the region had adequate seats to facilitate the flow of travellers to and within the region,” the CTO chairman explained. Nineteen destinations showed improvements upon their 2015 performance, with eight registering double digit growth of between 10.5 per cent and 26.8 per cent. The growth was led by intra-regional trips which rose by 12-9 per cent, followed by the European market which registered growth of 11 per cent. The CTO chairman told media at a news conference at Caribbean Week New York that regional tourism officials have recognized that more needed to be done to keep visitors occupied while in the Caribbean. “The CTO continues to work feverishly with our members to see how they can improve their product offering and diversify their markets,” he said. The CTO has projected growth of between 4.5 per cent and 5.5 per cent in 2016. Caribbean Week New York continues this evening with Rum and Rhythm, a benefit for the CTO Foundation, the regional tourism development agency’s scholarship programme which assists Caribbean nationals pursuing further studies in tourism and hospitality. The Empire State Building will also light up in Caribbean colours tonight in observance of Caribbean Week New York, which celebrates the sights, sounds, colours, culture and unique holiday experiences of the Caribbean. Caribbean Week New York is supported by American Express, Academy Engraving, Anguilla, Antigua & Barbuda, the Atrebor Group, the Islands of the Bahamas, Barbados, Bloomingdales, Caribbean Airlines, Cayman Islands, CitiTech Solutions, Dominica, El Dorado Rum, Empire State Building, Grace, Grenada, Golden Crust, Jade Mountain/Anse Chastanet Resort, Jamaica, Marry Caribbean, Martinique, Nassau Paradise Island, Nevis, Proximo, Resonance, The Real McCoy Rum, Saint Lucia, St. Kitts, St. Vincent and the Grenadines, Sugar Beach, Travel + Leisure, Resonance Consultancy; Trinidad and Tobago, Turks & Caicos Islands, Sugar Bay Resort & Spa, Unique Vacations, Inc./Sandals and Williams-Sonoma.